Our state-of-the-art gym lets you complete your daily workout anytime of the day for free. 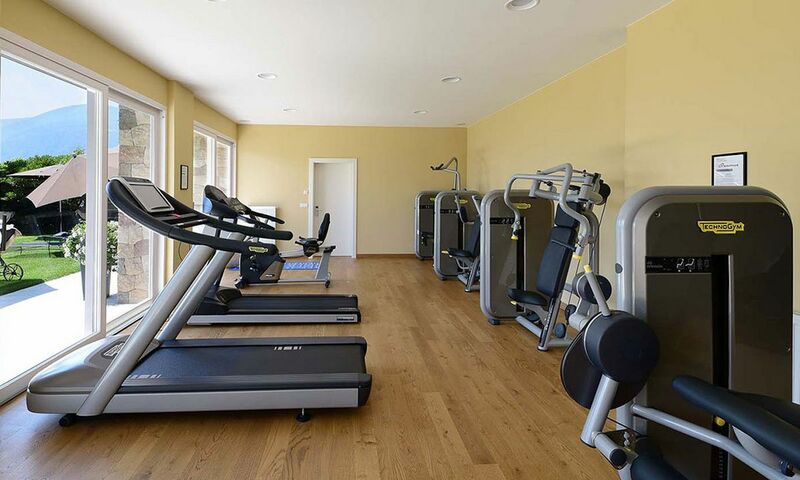 Our fitness facilities include brand-new equipment by renowned quality brands such as Technogym. Try the speed wellness method with the innovative invention of Board 3000. This allows you to effectively achieve results and dissolve blockages, tensions, as well as back pain in only 15 minutes a day. Expert wellness and fitness instructors are available between 8 and 8.45 am Monday through Friday, providing you with valuable tips for your personal fitness and well-being. Various classes on weekdays ensure a good start into the day with aqua aerobics, weight training, yoga practice, Pilates, wake-up exercises, and core sessions. Let us know about your fitness goals and interests upon booking, and we will try our best to integrate your wishes into our weekly activities offer. Our wellness treatments ideally complement your daily workout and provide rest and rejuvenation after a long day out exploring or strenuous physical activity. If you would like to try one of our classes before delving right into group exercise, we will gladly arrange for personal training with professional instructors. Book your 25-minute session for one or two persons for only € 30 or a personal training at our reception or online now.